A young Dublin wife & mother spent several nightmare days desperately searching for her missing husband in late May 1921. Sadly there was to be no happy ending. The young woman eventually found her husband on Sunday 29th in the Mater Hospital, feverish, raving and unable to talk sense. She was told he was dangerously close to death. Sean Doyle, also known as J. J., died the following morning from pneumonia due to a bullet through his lung. 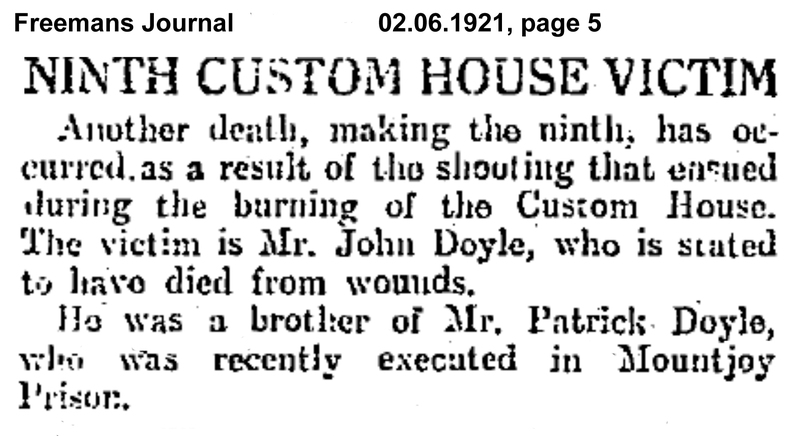 He became the last victim of the Burning of the Custom House. At the military inquiry Mrs Elizabeth Doyle said her husband “worked as a bookie’s clerk and she had no idea of his political views”. She added he hadn’t been well for a week or so due to a past operation on his stomach. But on the morning of Wednesday 25 May he felt fine. About 11.30 he told her he was off to business at The Curragh Races. He didn’t return and, very worried, she began checking all the hospitals. Sean Doyle was the oldest and the only married man of the five IRA who died after the Burning. Apart from his widow he left a 10 month-old daughter. Doyle was an experienced IRA Lieutenant in the elite Squad, drafted in to protect the Lads detailed to burn the Custom House. While shooting his way out of the building with Squad colleague Jim Slattery, both were hit by Auxy bullets on Beresford Place, yet managed to get away up Gardiner Street. Slattery’s hand was mangled but Doyle was mortally wounded. At about 2pm he was left at the Mater by some men who did not give any names, including the casualty’s. Sean was admitted under the name “Brown”. The hospital kept no written record and did not report his wounds to the authorities as military orders dictated. This later became the main issue at the inquiry into his death when the doctors were severely censured by the military for failure to follow the law. 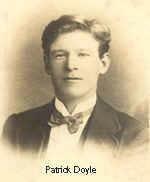 Born on 13 July 1887 at 48 Tyrone Street, Dublin, Sean was a son of Patrick Doyle, a Miller & Kate (Dolan). He was baptised John Joseph in the Pro-Cathedral. After his father’s death his mother remarried in 1896. The family moved across the Liffey to George’s Quay, directly opposite what must have looked an imposing Custom House to the young Sean. By 1911 they were back again on the north side, in Buckingham Place off Portland Row. Sean joined the Volunteers in 1914 and was also sworn into the IRB. At Easter he fought with F Coy, 1st Batt in the North King Street area, was arrested at the Surrender and deported to Frongoch. During the Tan War he was out early as a member of the IRA party who attacked Lord French’s convoy at Ashtown in December 1919 when Vol. 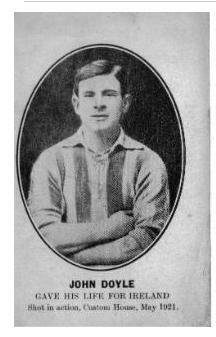 Martin Savage died and Dan Breen was wounded. 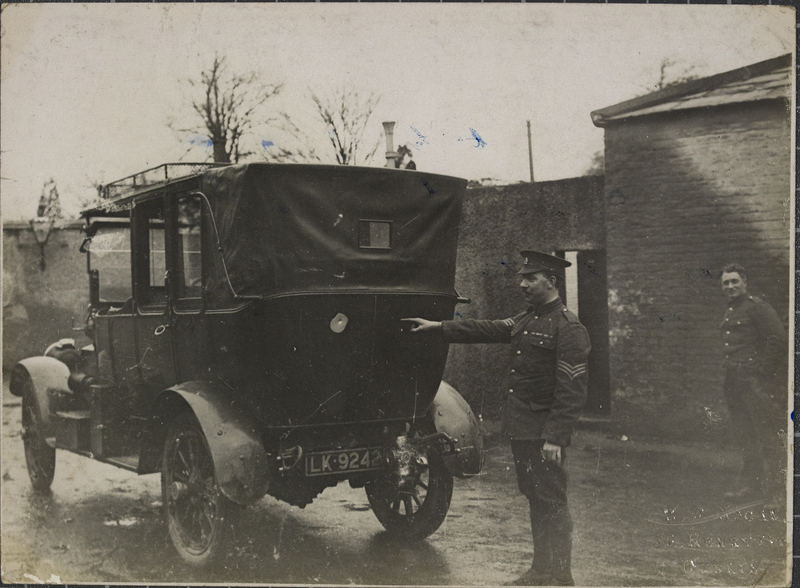 He was also on the arms raid at Collinstown Aerodrome and many Squad operations, most notably the famous attempt to rescue Sean MacEoin (under sentence of death in Mountjoy Jail) using a captured armoured car, in early 1921. Sean played field sports – code unknown to this writer – as we can see from this memorial card published after his death. 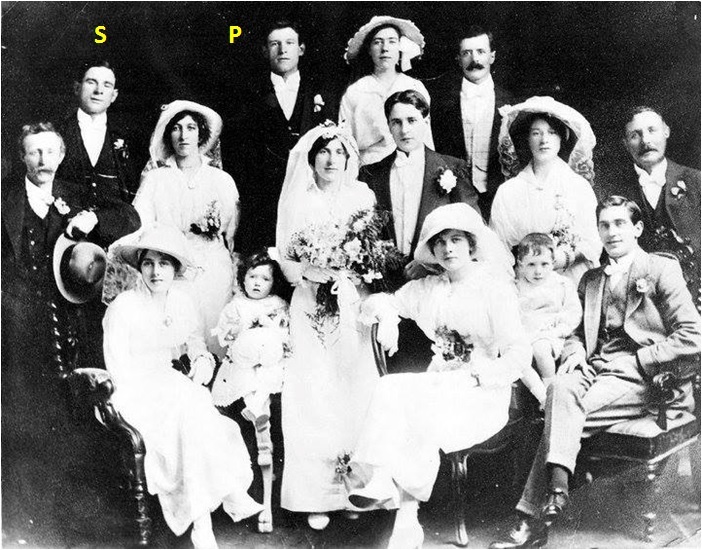 In 1915 Sean had attended the wedding of his sister Sarah to John C Wood* and appears marked ‘S’ on left in this family photo. His brother Patrick (marked ‘P’) was also destined to die for Ireland. 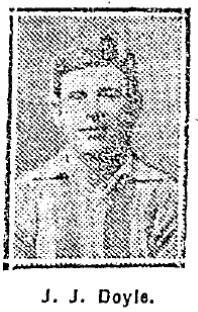 Arrested with a party of Volunteers after an ambush attempt at Drumcondra was reported and counter-attacked by Auxies, he & 3 of his comrades were among those hanged in Mountjoy on 14 March 1921. Patrick went down in history as one of The Forgotten Ten. 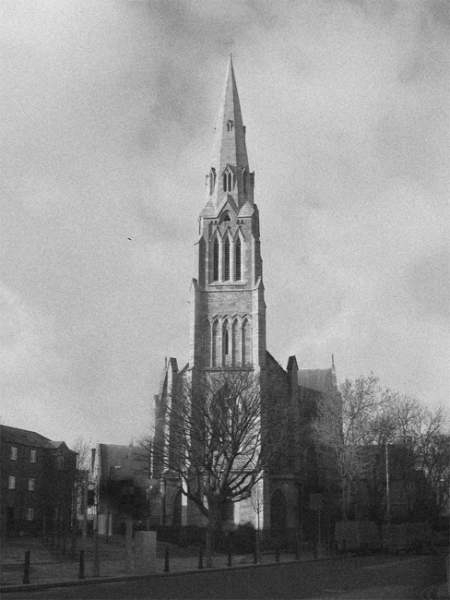 Sean had been best man for Patrick at his wedding in 1916 and in 1919 he himself married Elizabeth Ward, a docklands-born girl, in St Laurence O’Toole’s Church. At the time of his death they lived with their little daughter, Kathleen, at 55 Amiens Street – an address made famous as one of the tobacconist shops run by Tom Clarke before 1916. The papers had reported Sean’s death as the ninth victim of the Custom House battle. The dogs on the Dublin streets knew the story. However, the military inquiry (very “correctly”, British-style, in this writer’s opinion) decided there was no evidence where Sean had been wounded or who had shot him. Verdict? “Accidental Death” by gunshots of yet another Irishman in the Tan War. Elizabeth Doyle may have left many things unsaid at the inquiry. But proudly and defiantly the family death notice described her husband Sean as an IRA officer who died in action. Whether myth or not, Sean’s last attributed words, delivered with a big smile to a nun in the Mater on the night of the Burning of the Custom House as gunfire and bombs echoed round the city, went something like: “Sister, thank God the fight goes on, the Lads aren’t beat……”. An appropriate obituary for a committed but largely forgotten Irish soldier of those times? Sean Doyle was buried in Glasnevin’s Republican Plot less than a week later. There are three other great stories behind those names…. His widow Elizabeth was eventually granted a military pension and the school fees for her daughter Kathleen to age 18 were funded by the State. Mrs Doyle was also awarded Sean’s 1916 posthumous medal. Their daughter Kathleen married in 1943 and went on to have her own family. Her mother Elizabeth never remarried and outlived her only child by 2 years, passing away in 1985 in a Dublin Home for The Blind. *The Doyle and Wood families suffered many tragedies owing to their strongly-held political convictions – backed up by action – over two decades. The above post is about Sean & his immediate family because of his part in the attack on the Custom House, but there are other fascinating facts about his extended family.